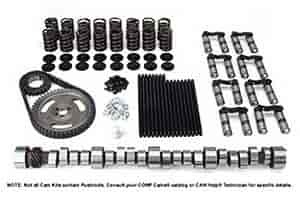 COMP Cams Xtreme Energy Mechanical Roller Camshaft Complete Kit Small Block Chevy 1955-98 Lift: .576"/.582"
Good in weekend warrior with 3000 or more stall. Needs good intake and exhaust with low gears. Does COMP Cams K12-772-8 fit your vehicle? It depends on the items in the kit vs the other kits.